LUCY Devlin strode past the finish line to win yet another 70-metre sprint at the Little Athletics track. With a time of 10.8 seconds, Lucy beat her friends Greer Sherriff, Makayla Zaini and Bella King in the Under-13/14 girls' age division. While Lucy enjoyed the win, she preferred other distances and the participation element of LA. "I have been doing it for eight years and I just try and participate in every event, but my favourite is the 400-metre event, Lucy said. 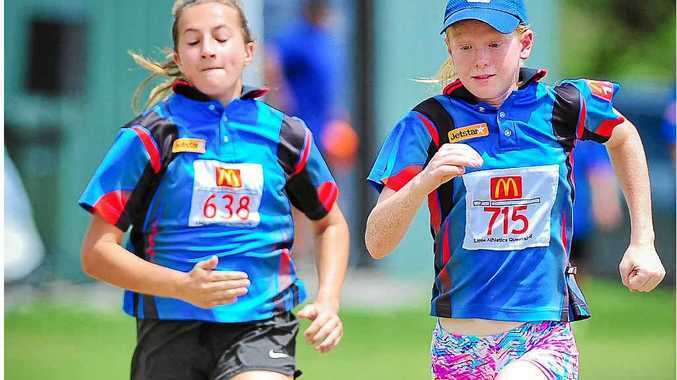 Sally Pearson is her role model - no surprises there - and the well-spoken Lucy added that being part of a State Championships campaign has been a highlight. Lucy spends her downtime by hanging out with friends and trying not to be stressed before competition. Other than burning the track, Lucy also plays touch football and hockey, along with swimming. LA head coach John Sherriff said Saturday's turnout saw 130 youngsters compete in javelin, long jump, high jump and triple jump, as well as shot put. "The kids are a dedicated bunch and it was great to see the Under-9 kids encouraging each other in high jump," Sherriff said.